APRIL FOOLS!! HA HA!! GOTCHA, SUCKERS!! You all are getting a little foretaste of the “joke” that Jemima is going to play on her class today at lunch. Are you making sure to notice the grated “parmesan” that’s actually white chocolate? Huh? Huh? Are ya? I have to say, these are turning out a great deal more spaghetti-like than I first imagined they would. 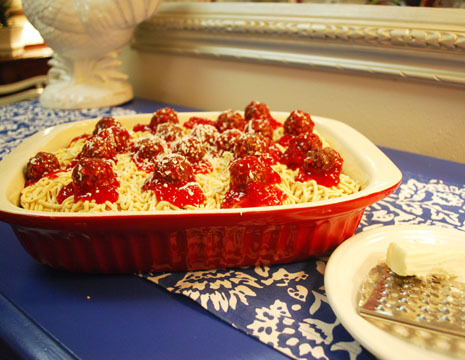 The meatballs are those hazelnut chocolate what-nots, rolled in low-sugar strawberry preserves. (The low sugar preserves give the best color apparently.) The frosting is very wildly squirted out of a ziploc bag with the tip snipped off. Not bad, I have to say. Now, come on. Is that rude, or is that rude? Granny, Ben’s mom, was in town visiting . . . and she was over at Ben’s sister’s house when she received that pitiful little call. She was at our front door in about 45 seconds flat – at which point she was very rightfully peeved at her badly behaved son. When Nana got the call she instantly flew into action with lots of “Stay right where you are, don’t move, I’ll be right there . . . don’t get off the phone, hang on, just a minute while I call Papa on the other line . . . . ” Somewhere in there Ben finally had Jemima say, “April Fools!” and then Nana was very rightfully peeved at her badly behaved son-in-law. I, meanwhile, was very rightfully peeved that anyone actually believed that I would have left my 5 utterly incompetent children unattended while I went off to get a mocha! Loved your story! Our oldest child turns 14 today. Our best April Fool’s joke happened the day she was born. Her due date wasn’t until April 14, so I called Dad to let him know I was at the hospital in labor, I couldn’t resist following that with “April Fools!” (I had an epidural, so I could joke about it). As soon as he started laughing and chiding me for the joke, I yelled “Just kidding — we really *are* at the hospital!” Mom was standing right behind him and didn’t know how to react! 😀 We still laugh about that one! Oh, those are so great!!! Hope Ben has gotten the evil April Fooling out of his system now. Sounds like he learned his lesson. I say that mocha-call falls under “unforgivable sins”. Hilariously worded though. And I was tricked by the meatballs, like a sucker. Good job! White chocolate was a nice touch. Oh and that pitiful little phone call “joke” would have taken about a decade off of my life. When I heard “April Fools” I don’t know whether I would have been furious or too relieved to be furious,lol. Ahhh, you totally got me!! My first thought was “Bekah does not usually post on last night’s dinner; there must be something more to this.” And sure enough. WOW! That is totally convincing! What a great April Fools cake! Thanks for a good laugh this morning. Great cupcakes, great story! Hey! Do you realize that you just called a bunch nice church ladies “suckers”? Ouch. “Suckers” was by far my favorite part. And now I want a spaghetti cupcake. I’m hungry! Those cupcakes are awesome and the story was great too. That made me laugh till I cried!!! Too funny Bekah! Okay that spaghetti-cupcake concoction is freakin’ awesome! — Good job, guys! The cake is fantastic! The phone call…priceless! I’ve seen this book, and I confess it’s tempted me to break my no-cupcakes rule. But, hmmmm…I don’t see why a pot-of-spaghetti big cake wouldn’t work. Hmmmm…. Bekah, your cupcakes look fantastic!! Sarah, I had my sixth child two months after my oldest was seven (no multiples tyvm), then I went on to have seven more in the next eleven years. My advice is RELAX!! (I think I learned this with number four, so maybe you are ready too!) Take one day at a time and enjoy it. These are busy busy years, but they are such a joy. You really will look back and wonder where those years went. Also remember that God gifted each of us differently, and you probably have many skills that I lack, and vice versa. It makes life more interesting and enjoyable! Bekah wouldn’t need to post all her crazy antics and fantastic projects if we could all do it. Some day we will be like Nancy, and have grandchildren running all over the place – JOY!! (I have told mine that when they drop by with the 144 grandchildren they have promised, please put nametags on them with the child’s name and son or daughter of; I will be too senile to figure it out for myself:-) Blessings on your family!! Oh, yes, Amanda. Quite addicted! Sarah! Good Heavens! I certainly hope I’m not giving the wrong impression . . . I mean, you should see the berserko ridiculous mania that happens around here! I currently have a laundry pile that is literally up to my eyeballs, and I’m running about one and half laps behind on most of my life! I am still laughing however, and am (hopefully!) mentally sound – but it ain’t a breeze, I can tell you that much! When my kids were all pretty much toddlers all at the same time, I remember more than once actually falling asleep at the dinner table . . . it was frequently the first time I had sat down all day! (And if you think I can’t nurse standing up, you got another thing comin’!) The thing is, there are so many absurd moments . . . and you can only either laugh or cry, so whenever possible I try to pick the more fun option! The one moment that I have always felt really summed up about 6 years or so of my life was one day when I was very big pregnant and I had to fish something out from under the bed. I abominate under-the-bed-spaces. They’re so hideously populated with dust-bunny encrusted old socks and things . . . and every single toy in the house always seems to wind up under the bed. Usually I would send kids on missions to pull things out, but for whatever reason I had to do it myself this time. And of course, at 9 months pregnant you can’t lie flat on your stomach. So I was all torqued over sideways, and wriggled under as far as I could get . . . and whatever that mystery object was (I can’t remember now) it remained just out of reach. So I got a coat hanger or something and was trying to hook it with that . . . and then my toddler wandered into the room and got up and sat on the back half of me that was sticking out from underneath the bedspread. I was totally pinned. I was hollering and yelling for him to get off, but since I was shrouded by the bedskirt and bedspread, I was unable to make myself understood. I was trying to fling an arm out behind me to lift the bedskirt, but I couldn’t reach it due to my awkward positioning. Total claustrophobia was beginning to set in as I yodeled and hooted from under the bed with a three-year-old frolicking about on my back, thinking it was all a great joke. Right at the moment when I was really about to lose it – my contact popped out. Yes. Just that little touch of something extra to make life utterly unbearable. It’s at those moments that you can either lose the bubble completely and burst into tears . . . or you can laugh. I remember just laying my head down and laughing myself sick – I just had to wait for the little stinker to take it into his head to get off of me and let me up! I feel like that moment was sort of my defining standard of frantic, absurd, nonsense! When things are nuts, I think to myself that I may be stuck under a bed in a swamp of old dust bunnies, I may be pinned by a three year old, I may be on my belly on the floor at nine months pregnant . . . but has the contact actually popped out yet? The popped contact is the 10 on the Richter Scale for me. Anyway – that’s not super helpful, but it’s all to say that I feel your pain, and it’s crazy and ridiculous . . . but usually it’s pretty funny too. Well, I have to tell you I cried myself to tears after reading that story!!! The whole household is running over to see what’s so funny. Only a mommy can truly appreciate it, I think. 🙂 Easter blessings, everyone! This makes my life sound so easy with only a 3 and 1 year old in the house! But really my life is very simple. Nevertheless, laughter is wonderful advice for every hard situation. So, i’m curious, how did the class respond? Were they April fooled? This is fantastic! We have just one in school so far, and his birthday is in summer, but I can definitely see me wandering into his class on April Fools to celebrate his birthday (NOT) with spagetti (NOT!). This is going to be fun for next year. Thanks! I am going to weigh in on this one, and I’m sure Bekah won’t mind. Remember that God has made each of us with totally unique personalities and gifts, and we have to work with that. We all have different weaknesses and temptations. That’s the way it is. It would take quite a bit to get Bekah to yell at someone. She is much like her father who would rather get a root canal than put someone out. They both have different temptations than you and I do. Though we can and should learn from one another, we can’t be one another. I am happiest with a tidy house, so I do what I can to keep it that way. Like you, my head gets messy if my house is messy, so everyone is happier if I work to keep it together, as long as do so cheerfully. If I become tyrannical about it, well, that’s no fun for anyone. But if I know I’m heading into a time when everything is going to fall apart, I do much better if I pray ahead of time and get to battle stations. Then the mess does not get the better of me. But if I go into it careless of my soul, I’m bound to get whammed. All of us, whatever our personality or strengths, are commanded to be joyful in all things, messes included. The biggest helps to me have been preventative prayer, and a family full of jokers who keep me laughing even when I may not feel like it. And after all these years, it has rubbed off on my soul, much to my benefit. So a tidy house is good, but not at the expense of your joy. Joy is better. Thank you, women, for your replies, for this discussion. I am glad I needed to wait (Easter festivities and the stomach flu hitting us — yuck!) to respond back so I could hear more. I’ve been trying to look at all the absurdity and see the joke there. And I’ve been trying step back, breathe, and pray more deliberately for joy & peace in the midst of the infant/toddler drama. I was re-listening to Pastor Wilson’s Ecclesiastes series and thinking today how having joy in the midst of all this is a gift straight from God’s hand. I can definitely pray for it, but I can’t muster it up out of my fictitious personal artesian well, right? I also can’t magical with my super-hero will-power alter my personality. I am the daughter of a Puddleglum who has “inherited” many of his strengths & weaknesses. I will diligently pursue sanctification but realize that holiness does not mean I get to be someone else. I think it would be fun (for me AND my family) to be Bekah for a few days, though (-: — I’d love to be a laugh-er. Instead I will pray for God to make me whatever the joyful version of Sarah Jo. looks like. Thank you again for your time & wisdom. Ooo, I liked this post in the first place, but I think I liked the comments from Nancy and Bekah even better – thank you! Next up, could you set up cameras in your homes so we can all spy on you constantly? I promise to call for help if I see someone stuck under a bed with a toddler on them. Much obliged!